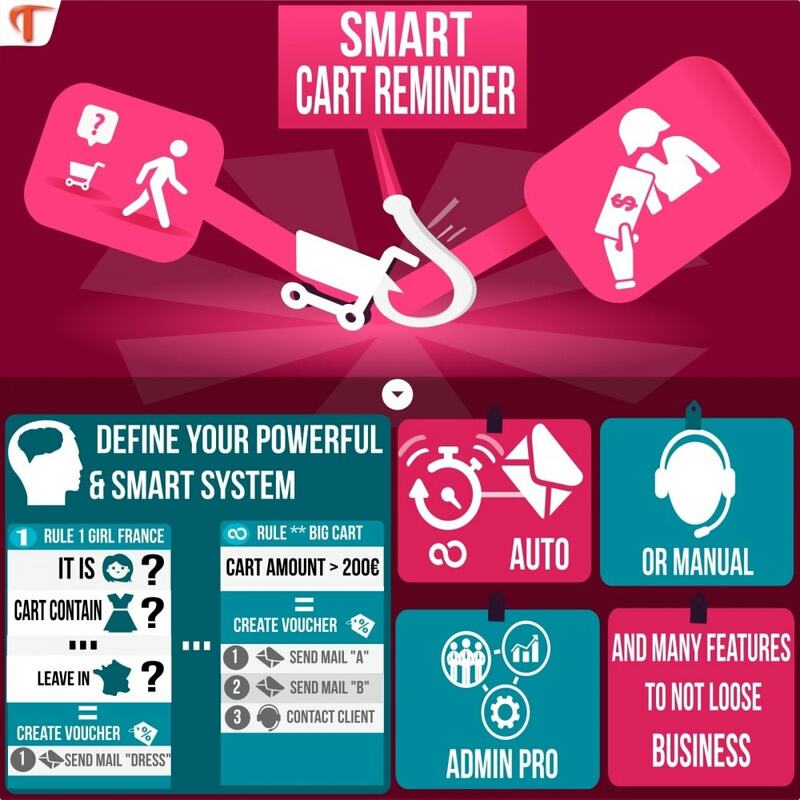 According to the abandoned cart content, and information about the customers, the Smart Cart Reminder module is the advanced solution that allows you to remind your abandoned carts in an autonomous and focused way. Rule 1 : For the cart that exceeds $90, which still contain available items in my stock, the customer is in USA. Then create a discount coupon to obtain the shipping costs for free. Reminder1: Send the « Free shipping costs » email. Reminder2: Send the « Only a few days to benefit from the offer» email. Rule 2: For the new customers, create a 5% Off Your Order. Reminder1: 1H after the dropped cart: send the «To celebrate your arrival 5% Off Your First Order » email. Reminder2: 24H after Reminder 1: send the « Only one day left to take advantage of this offer» email. Rule 3: From 15/11/2015 to 25/12/2015(Christmas time), create a coupon to obtain a gift on the order. Reminder 1: Send the « Surprise Gift» email. Reminder 2: Send the « Only a few days to benefit from the offer» email. Reminder 1: Send the « More information about our catalog dedicated to professional» email. 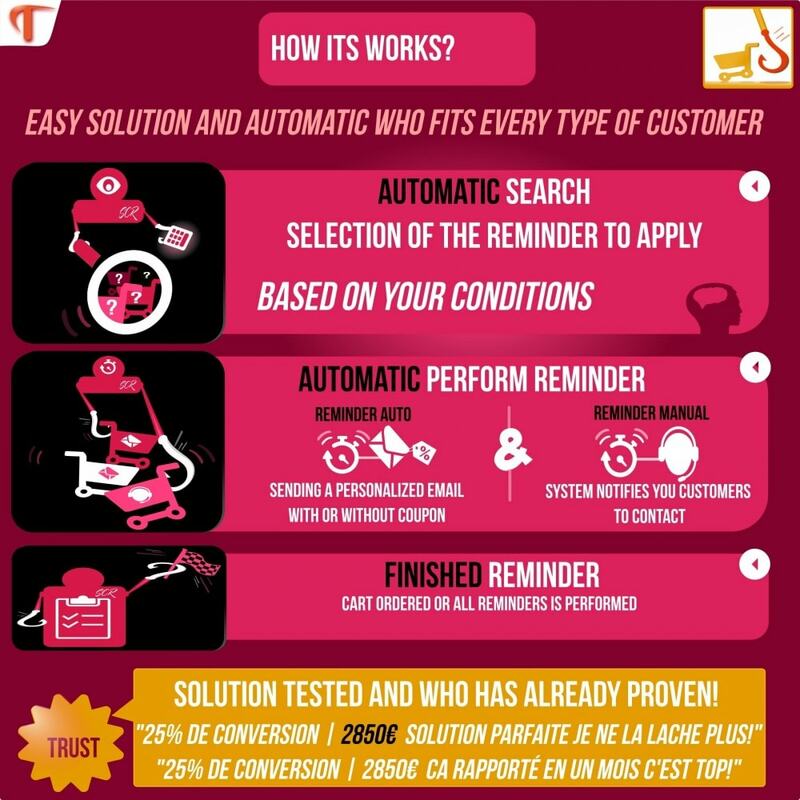 → I gain credibility by creating an intelligent and autonomous system which is no longer seen by my customers as an automatic emails or promotion distributor. 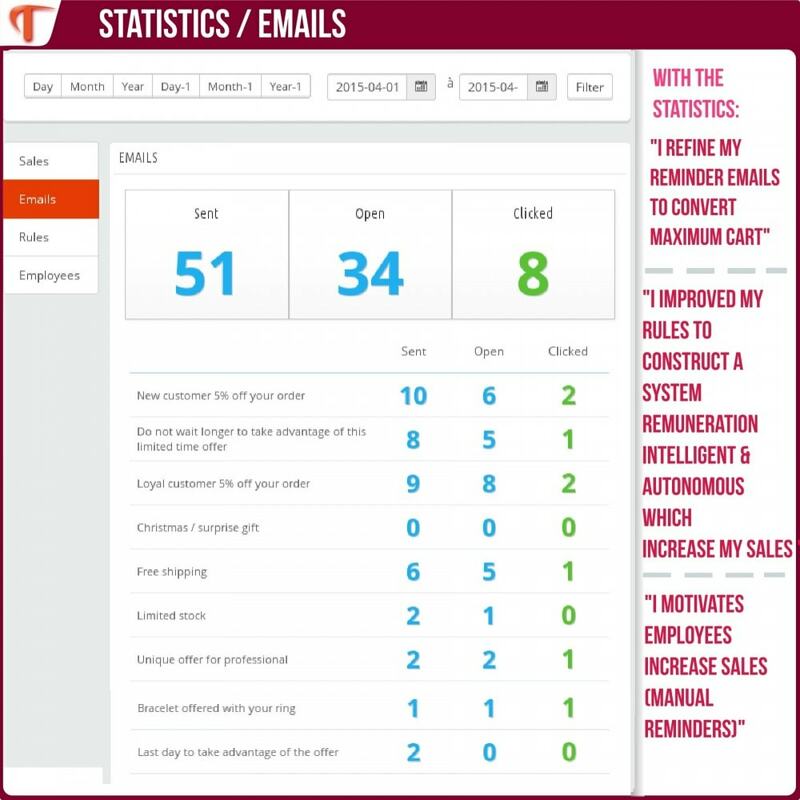 «Standard»: Sending an automatic email with a custom content of the cart to the customer. 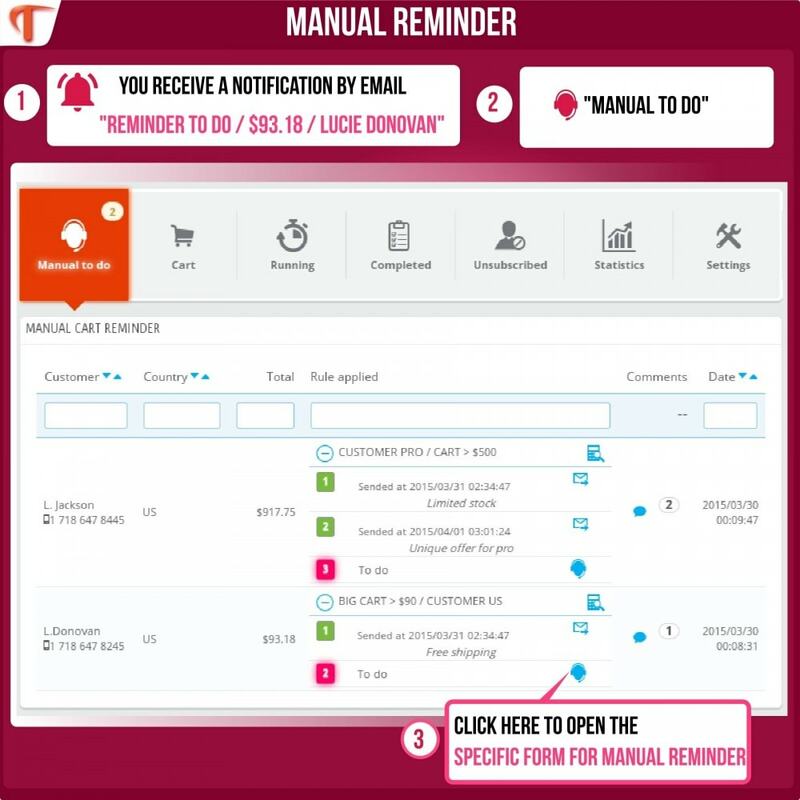 « Manual»: The module notifies you by email to communicate with the customer. 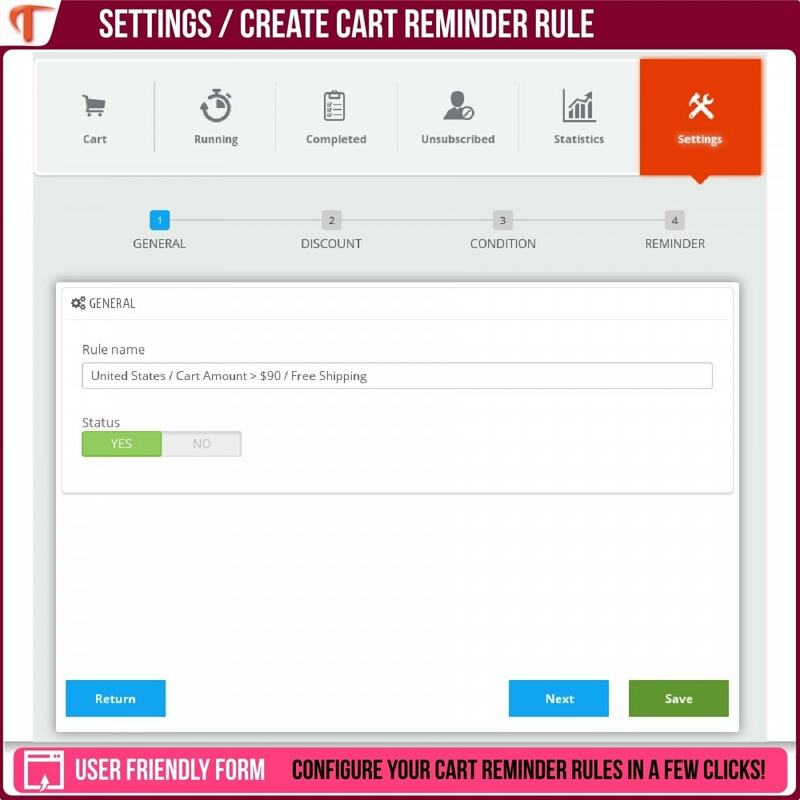 You can even set the type of reminder that will suit your cart. 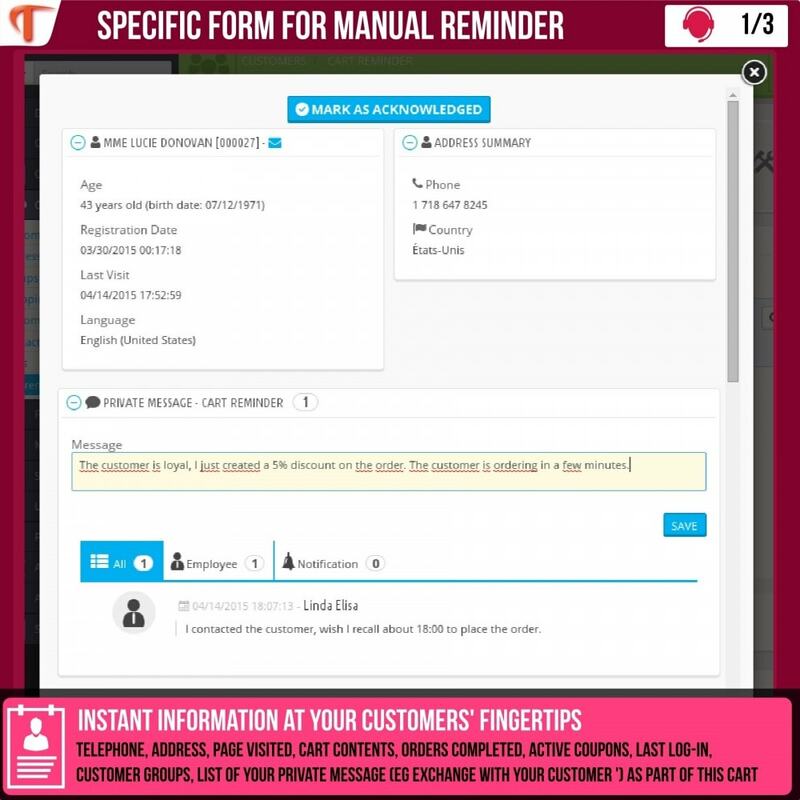 In one page, the module includes all the information of your customers; and includes many features dedicated for your manual reminders. Reports on employees manually remind customers. 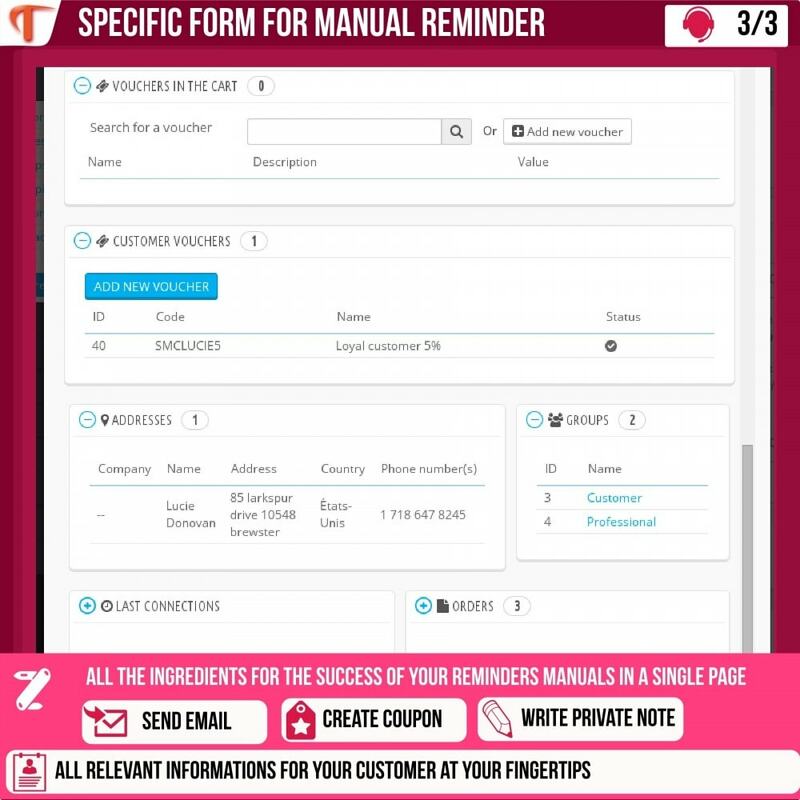 This report contains the number of orders made, the number of manual reminder processed for each employee. 1. I created my reminder emails, it’s easy and fast! 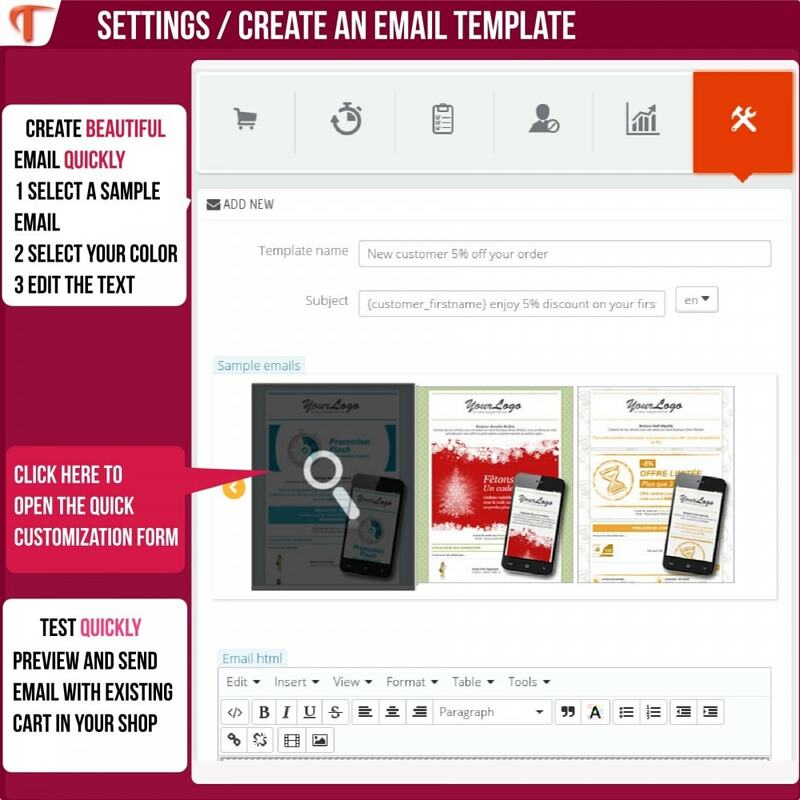 Several templates of emails delivered with the module, customize easily and quickly, select an example, edit the colors, edit the text, and here we go! 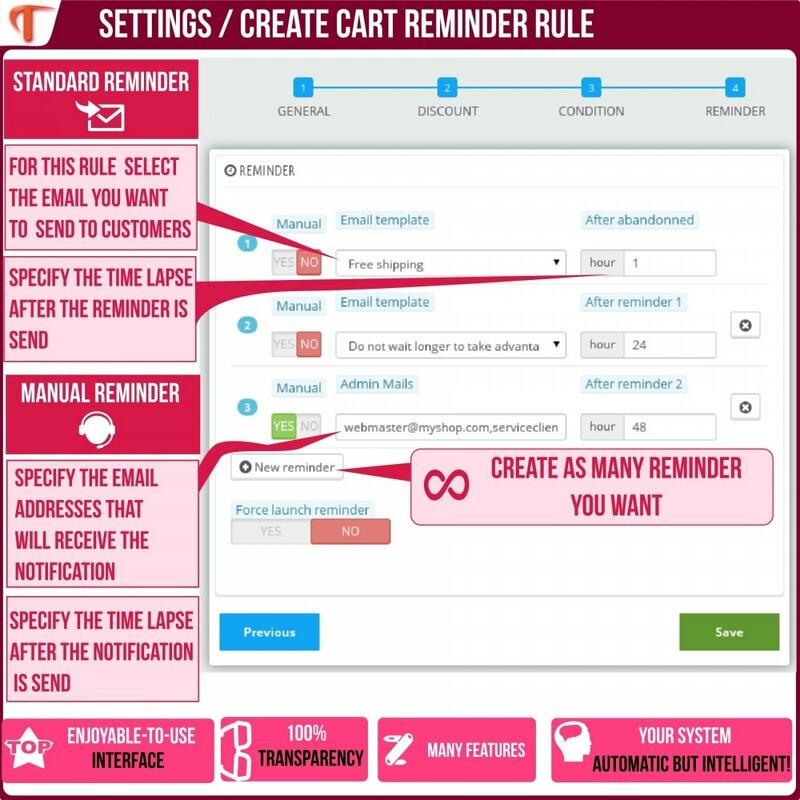 2- I create my cart reminder rules and I indicate for each rule the reminder emails to send. You have particular difficulty for the integration, you have some questions. Our team will be glad to support you. We are very sensitive about the responsiveness and the quality of our responses. Lots of options to help increase sales. Very friendly and responsive customer service. Highly recommended! « I tried the challenge and I am pleased, congratulations to the developers of this module. « I'm a merchant since 8 years ago, and I gave some ideas. In fact I wanted a new condition to treat new customers differently and according to my stock. 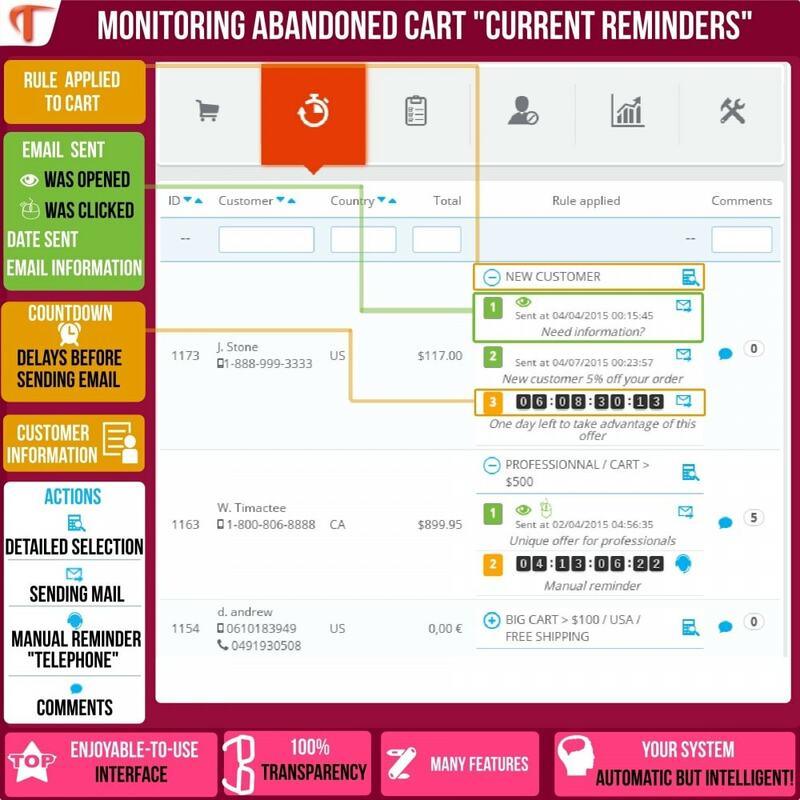 For each abandoned cart, see: applied rule, information of the customer, all executed reminders or run, the time remaining before sending the next reminder, open email or clicked. 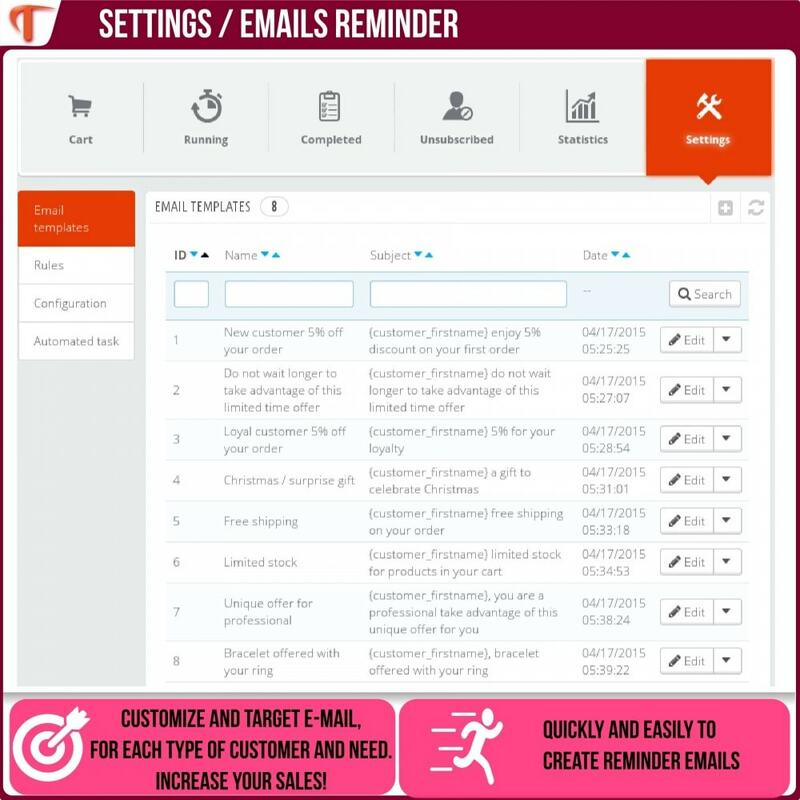 "Learn more about your customers; refine your reminders to improve the conversion rates"
Sales : Sales generated by reminders created during the selected period. 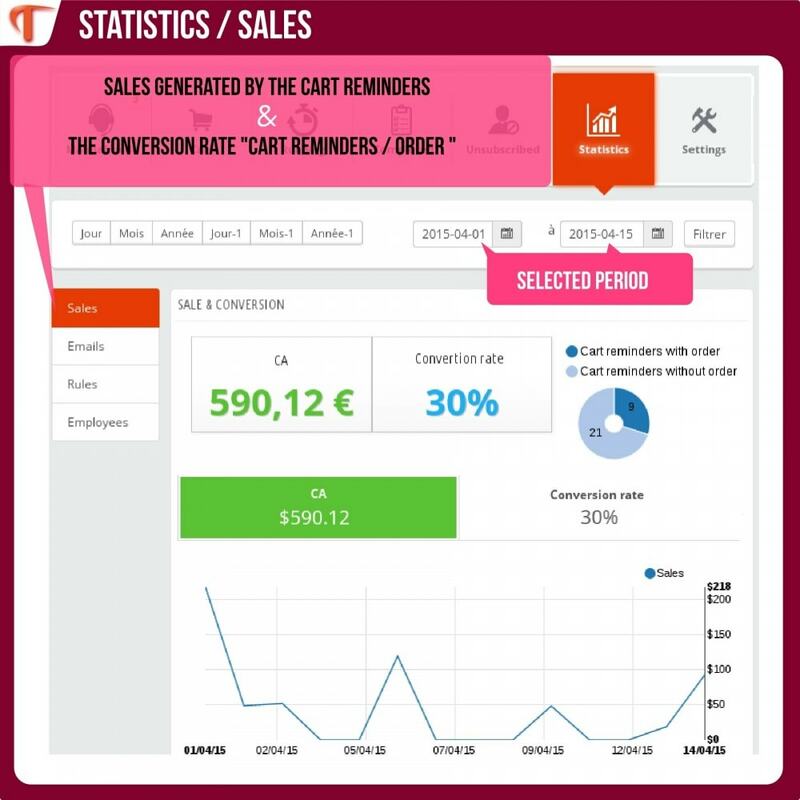 Graphical statistics to monitor revenues, conversion rates, etc. 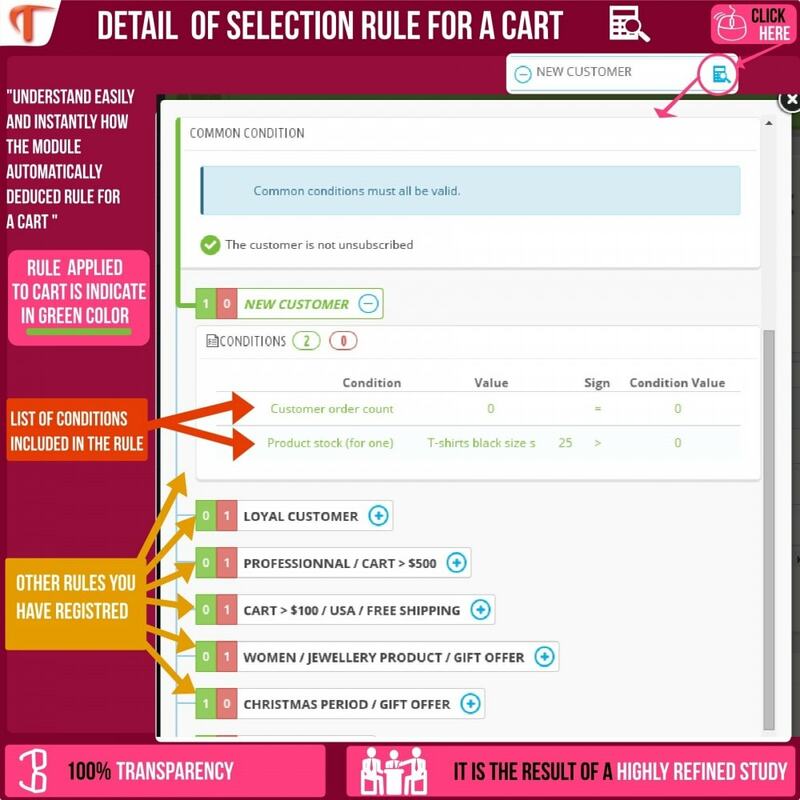 Rules: Detailed view for each rule, number of carts, number of orders, conversion, and total revenues generated. 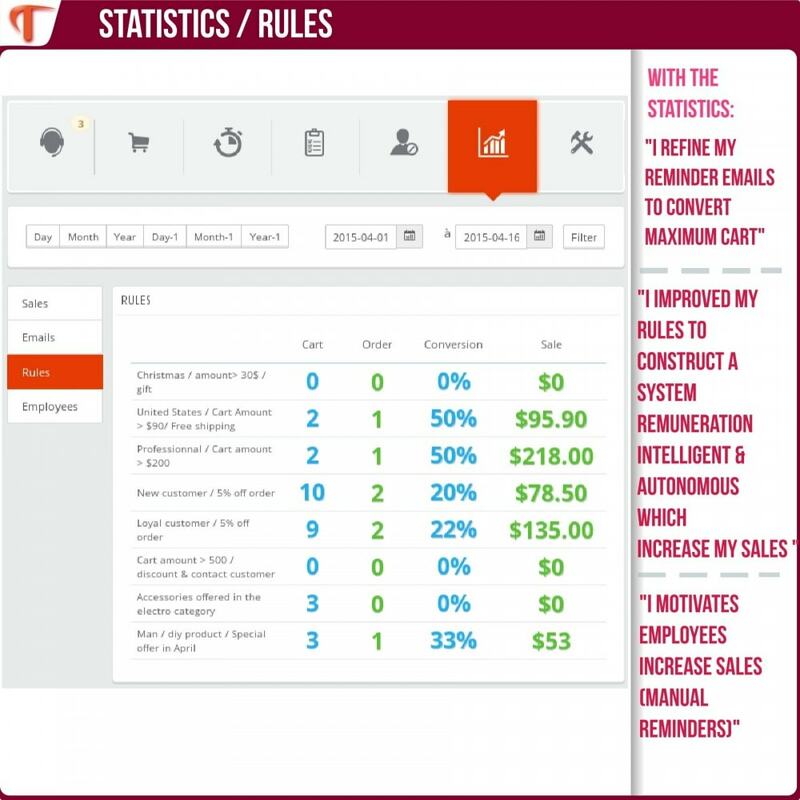 Employees: Useful for manual reminders: Detailed view for each employee: the number of reminders completed, number of orders generated, conversion, and total revenues generated. 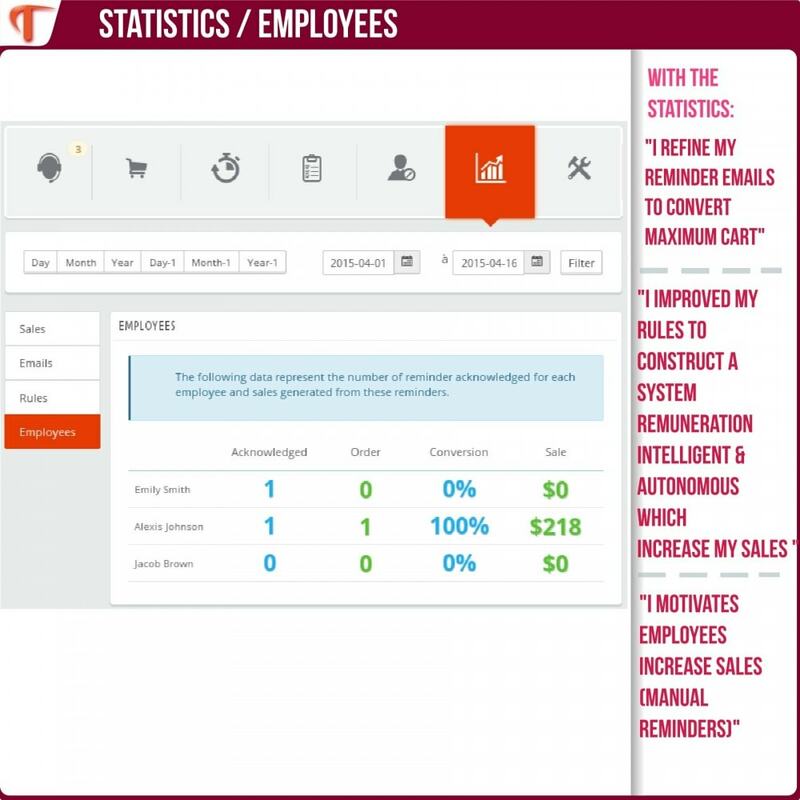 Create an unlimited number of reminder rules according to your purposes. 2. 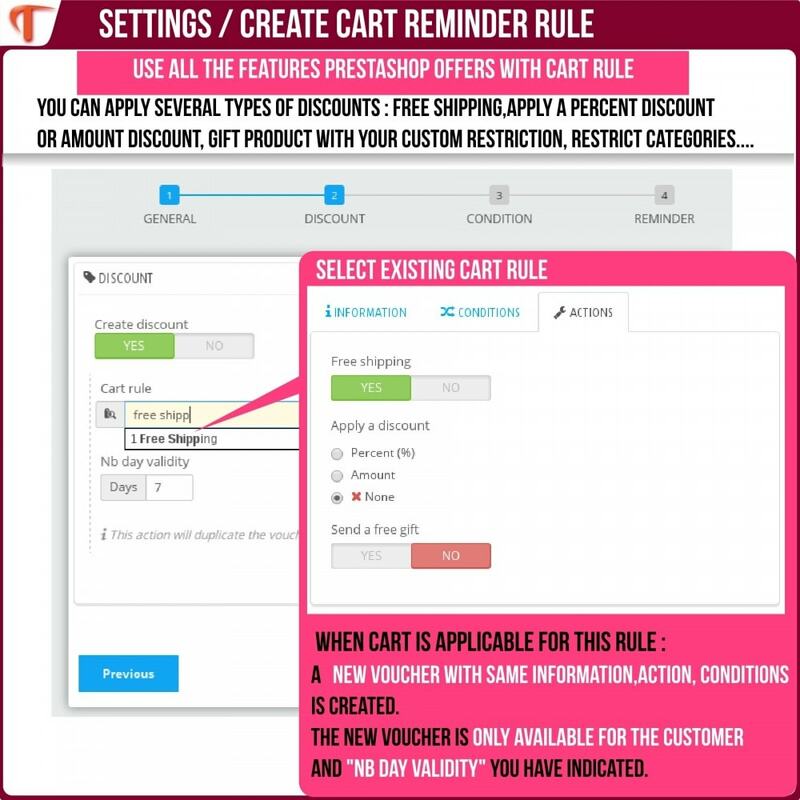 DISCOUNT SECTION: Indicate if the cart reminder rule includes a discount (cart rule). 3. CONDITION SECTION: Indicate under which condition the rule will be applied, add the condition(s) that you want the rule to validate. Conditions can be combined. Cart – Product Category : Choose the product category (ies). →You currently have a limited time offer on a product family and you want to notify the customer of such and that he must complete his cart as soon as possible to take advantage of it. →You want to suggest a related product with this kind of item. Cart – Amount : Comparison condition (less than, more than, equal to) a specified amount. 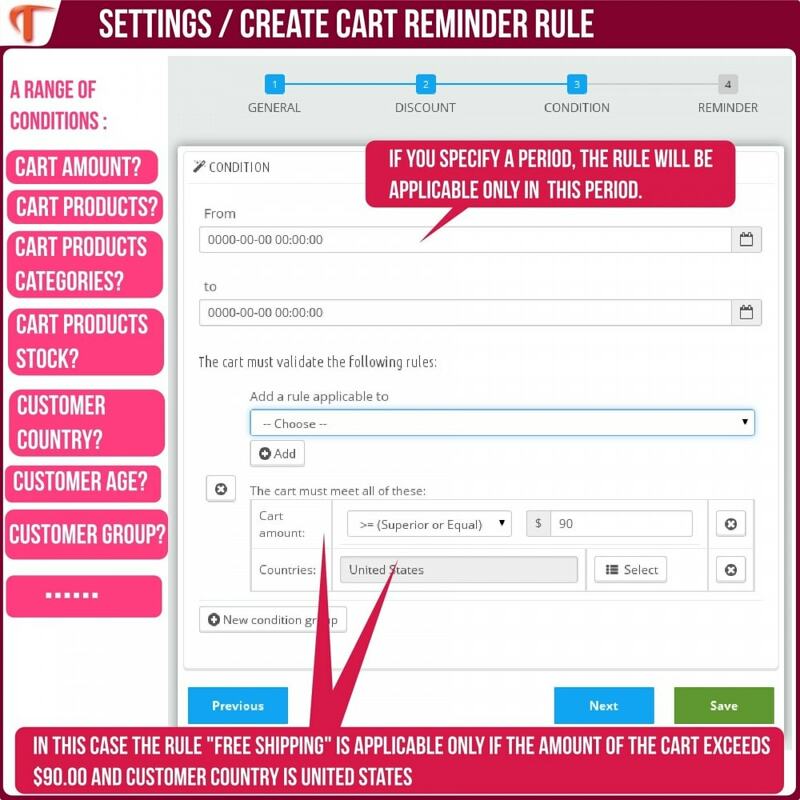 →You want to be notified and then call the customer when there is a significant amount in the cart. → Inform the customer that the remaining quantities are very limited. Customer number of orders : Comparison condition relating to the number of orders placed by the customer. → Allows you to determine if it is a loyal customer who regularly places orders. Customer group : The condition will be true if one of the customer groups is included in the list of groups you have defined. Customer country : true if the customer’s country is included in the list of countries you have defined. Customer gender : True if the customer’s gender is included in the list of genders you have defined. → Define occasions like Valentine’s Day, or provide an additional gift for Father’s Day. 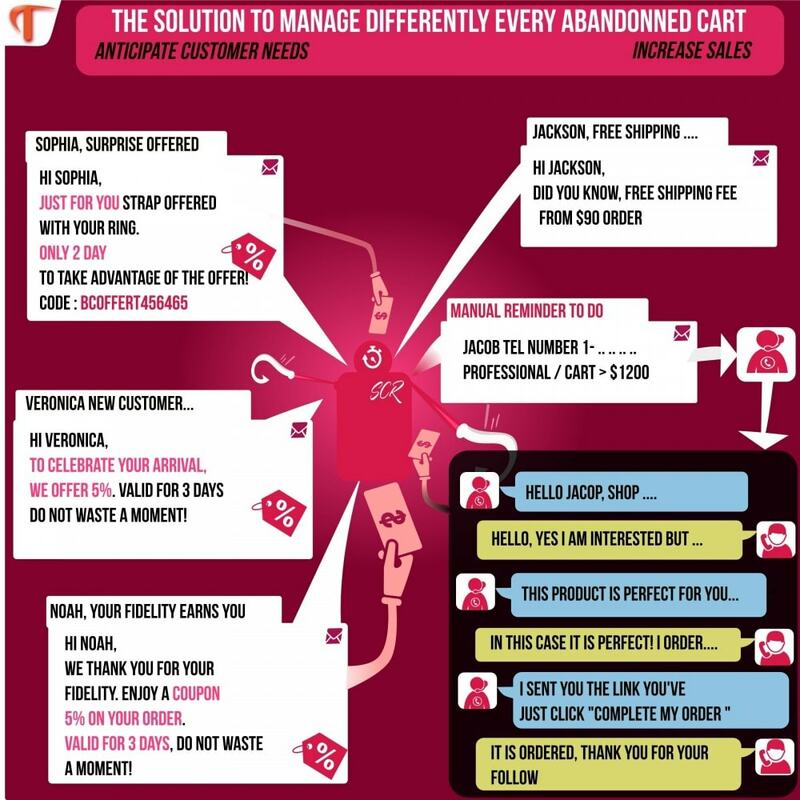 → Useful if you do not want to remind the same customer the same way for each abandoned cart. 4. 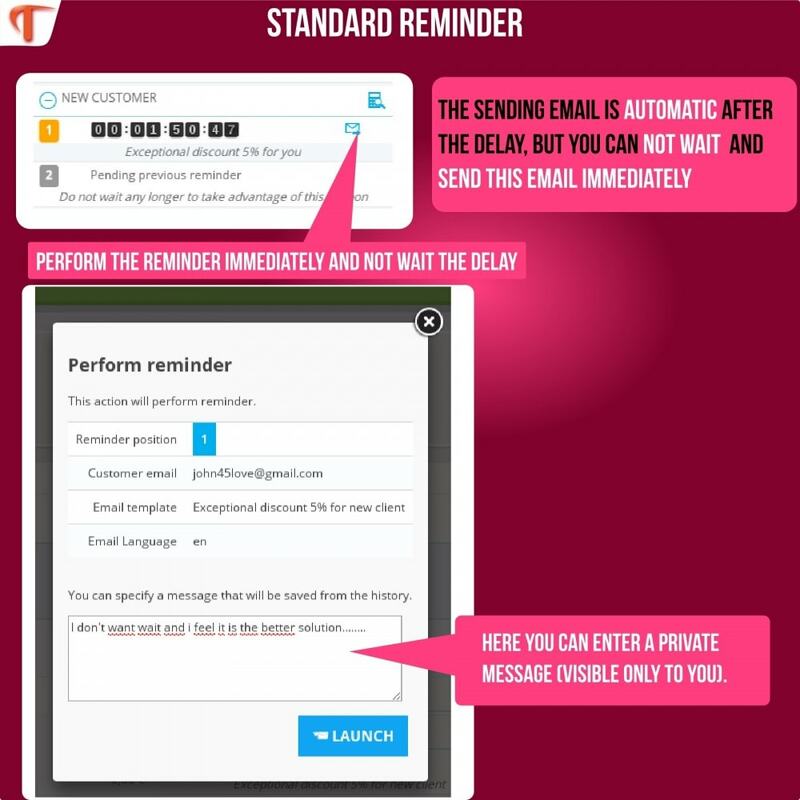 REMINDER SECTION : Define an unlimited number of reminders. Reminders are sent once the defined delay has expired. 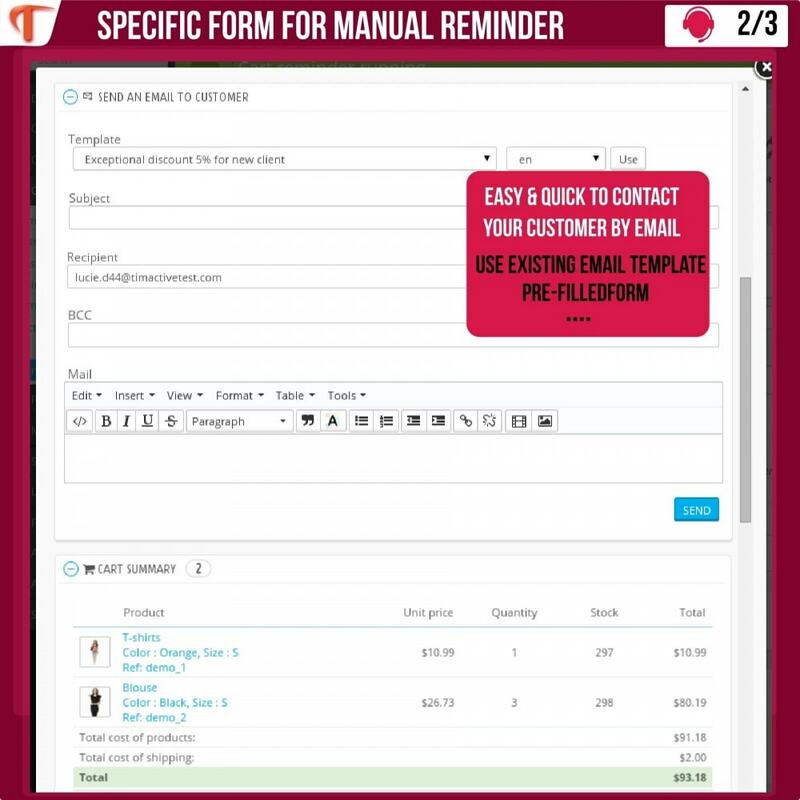 → Choose one of the email templates you have created in email templates administration. This email will be sent to customers. → Indicate one or more of your employees’ email addresses. These people will then receive a notification to inform them to contact a customer. 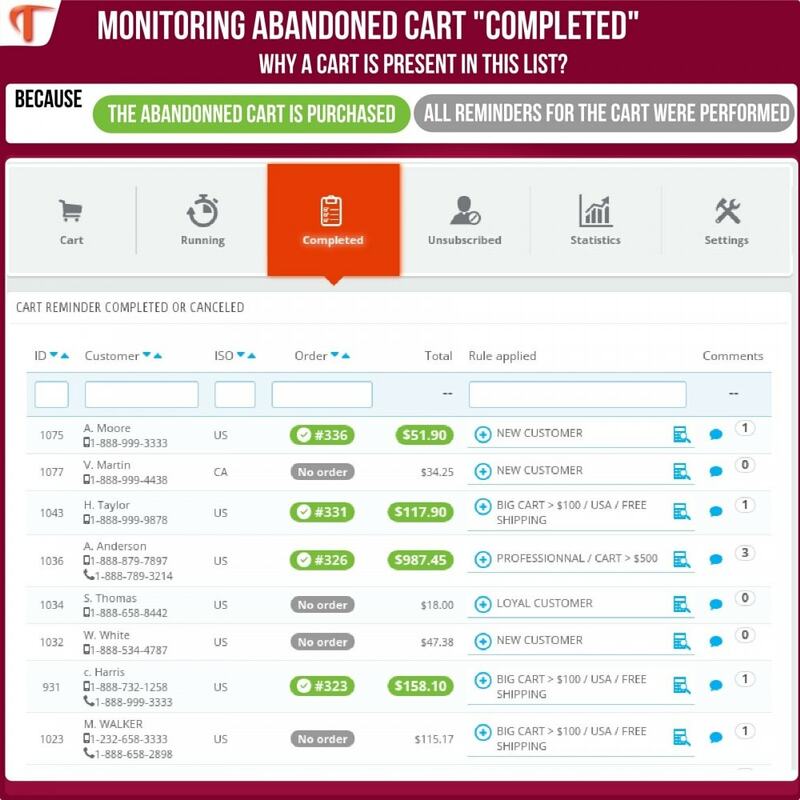 This notification includes all of the information about the customer and the cart. → Mark the timeframe before sending the notification. 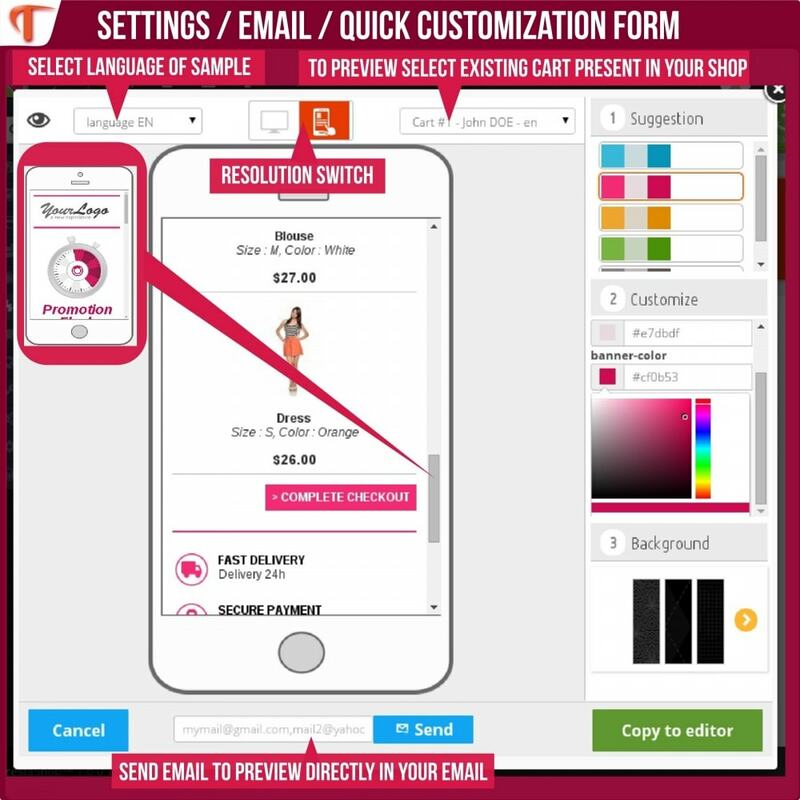 The email content will include the customer’s information as well as the cart contents. You can easily create 2 automatic first reminders and the next manually. 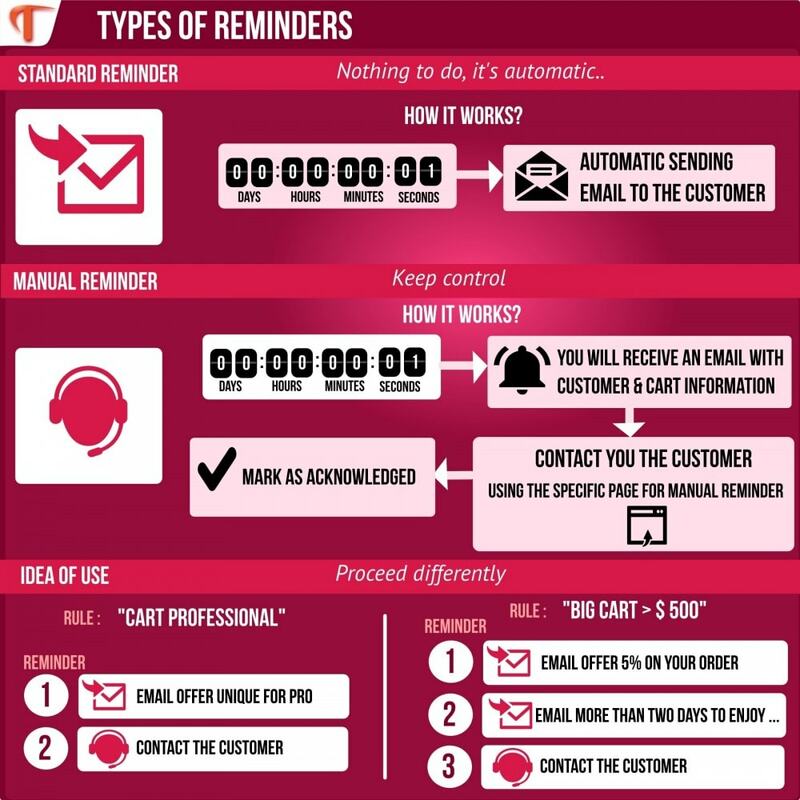 Then you will receive a notification if the customer still hasn’t completed the order despite two automatic reminders. Many solutions proposed the module is compatible with the cron jobs module available in your store by default. The “cron jobs” solution requires no particular action. Complete documentation of the module in the following languages: English, French. The documentation in Spanish is being implemented by our translator. 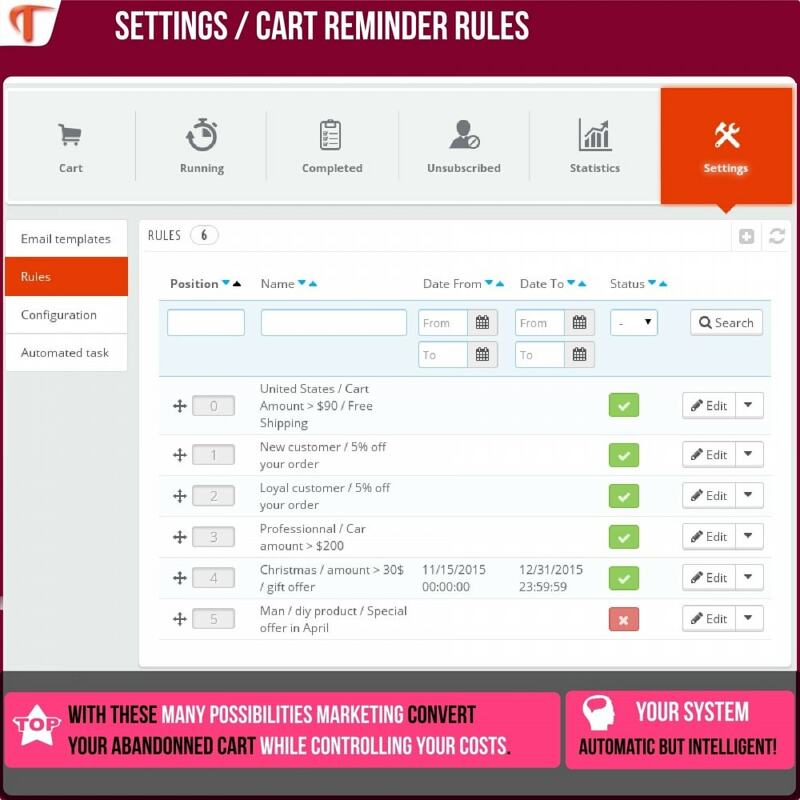 The cart reminder solution, that allows you to get close closer to the desire of your customers. Adapted email, adapted offers and credibility are all majors’ assets for your customers to feel special and recognized.